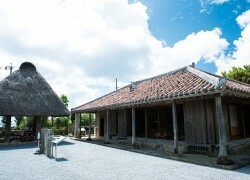 During the days of the Ryukyu Kingdom, the dimensions of one's residence were determined based on social status in accordance with the Restriction Law. Following the abolition of the law in 1889, the residence of the Medorumake family, which is now known as Uchinaa-ya, was constructed. The building was moved and reconstructed at the present location in 2005. Featuring a himpun -- a partition wall -- and other distinctive characteristics of an old-fashioned Okinawan house, Uchinaa-ya offers the opportunity to get a glimpse into the lives of Okinawans in the old days.